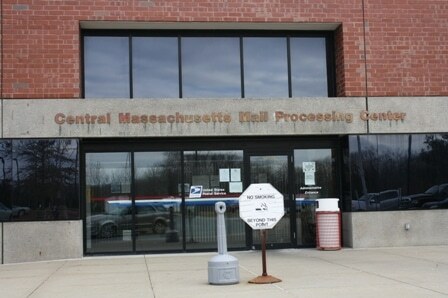 SHREWSBURY — Hundreds of employees at the Central Massachusetts Processing and Distribution Center will have to reapply for jobs elsewhere when services at the facility are consolidated with two others, a USPS spokeswoman said Thursday. John H. Flattery, president of the American Postal Workers Union, AFL-CIO Local 4553, which represents workers at the plant, said in an email he was notified that at least 383 jobs at the Shrewsbury facility will be eliminated. Melissa L. Lohnes, spokeswoman for USPS’ Greater Boston District, said it will not mean an end to the workers’ employment with the postal service. They will be given an opportunity to apply for jobs at other facilities, she said. “They will have an opportunity to have employment. But, at a different facility,” Ms. Lohnes said Thursday evening. “It’s not technically a transfer. It’s a reapplication for a position. That’s actually how a lot of the positions are bid for in the postal service. Ms. Lohns said the agency has every intention to work with employees to find positions. Mr. Flattery said under the union contract, USPS can “involuntarily reassign” a worker to another position within 50 miles. “But the simple fact of the matter is they don’t have enough jobs to put these people in within 50 miles,” he said. About 500 people work at the 192 Main St. facility. In June, U.S. Postal Service officials announced plans to resume consolidation of its distribution centers and the Shrewsbury facility is among 82 nationwide that will be consolidated, beginning this month, as a cost-cutting measure. According to the agency’s website, more than $2.1 billion will be saved by the end of 2015. The consolidation involving the Shrewsbury plant is scheduled for April, Ms. Lohnes said. 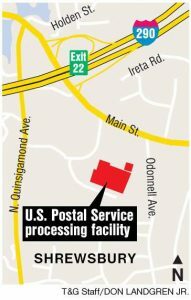 The plan calls for the mail processing operations to be moved to facilities in Boston and North Reading; delivery operations and a businesses mail entry unit will remain at the Shrewsbury location. Workers were told in October that no layoffs were planned. But local workers and union officials said the consolidation meant the Shrewsbury facility would be shut down and the employees moved to another facility or be laid off. Mr. Flattery said he went to the facility Thursday morning to notify the stewards who, in turn, informed workers. “It’s one of those things you kind of thought was coming, but you never really thought would happen. Now it’s happening and people are in shock,” Mr. Flattery said. The consolidations are a way to try to offset billions of dollars in lost revenue, mainly because of a drop in mail volume as consumers switch to electronics for communications and bill paying. But workers say the Postal Service is also heavily burdened by the 2006 Postal Accountability and Enhancement Act. Under the legislation, USPS, unlike any other federal agency, is required to set aside about $5.5 billion a year to prepay future retiree health benefits. 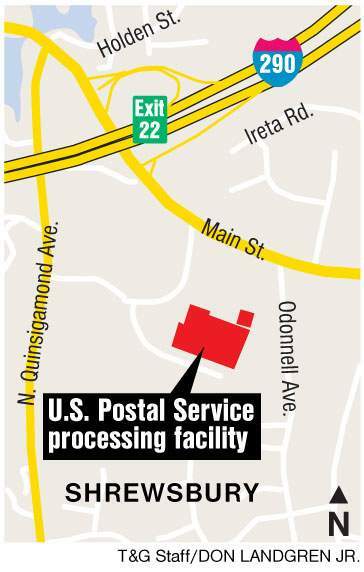 via Shrewsbury postal workers brace for job cuts – Worcester Telegram & Gazette – telegram.com. This entry was posted in Downsizing USPS and tagged 2006 Postal Accountability and Enhancement Act, Boston, Central Massachusetts Processing and Distribution Center, closures, consolidations, Greater Boston District, involuntarily reassign, job cuts, John H. Flattery, Local 4553, North Reading, PAEA, prepay future retiree health benefits, Shrewsbury. Bookmark the permalink.